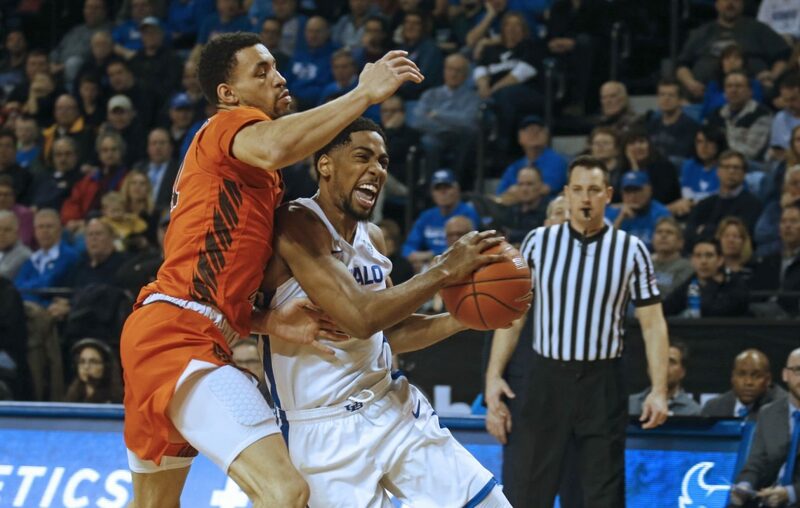 The University at Buffalo athletics department will retain an outside search firm in its process of hiring a men’s basketball coach, a UB athletic department spokesperson confirmed Monday. While UB did not disclose which firm it will use, a source told The News that UB plans to retain Atlanta-based Parker Executive Search. The university used Parker in its hires of athletic director Mark Alnutt, former men’s basketball coach Bobby Hurley and former athletic director Danny White. Parker Executive Search has not responded for comment to The News. Alnutt has not publicly commented on the hiring process or on potential candidates to replace Nate Oats, who resigned March 27 after four seasons as UB’s men’s basketball coach to take the same position at Alabama. "Thanks to Nate and the team’s success, the Buffalo coaching position will be extremely attractive and a national search is already underway," Alnutt said in the statement, released by the athletic department on Wednesday, the day Oats was hired at Alabama. "It will be conducted as quickly and as thoroughly as possible." Corporate search firms typically are used by Division I college athletic programs and major college athletic conferences. Search firms expedite the process of identifying prospective hires with the criteria a school, athletic program or organization has set for its next hire. Using a corporate search firm can cut a process that could take weeks to a matter of days. Corporate search firms also provide confidentiality in the hiring process. It acts as a third party in contacting prospective candidates, many of whom are under contract and cannot be directly contacted by athletic departments or employees in an athletic department. A search firm also vets potential candidates on behalf of a school or athletic department. On its website, Parker states that it "demands confidentiality and we complete most coach searches within 10-14 days and sports executive searches within 4-5 weeks, depending on the client's timetable." The Miami Herald reported Monday that assistant Chris Caputo has been contacted about the opening at UB. Jim Whitesell is UB’s interim head coach, and Bryan Hodgson remains as an assistant. Hodgson told The News last week that he wants the head coaching job at UB. However, Trendon Watford, a five-star recruit and a 6-foot-9-inch forward from Birmingham, Ala., posted a photo on his Snapchat account of him with Oats and Hodgson during Oats’ visit Sunday in Destin, Fla.
Hodgson did not respond for comment to The News in regards to the photo, which has been widely circulated on social media. Oats told reporters in Tuscaloosa, Ala., last week that Hodgson is "definitely coming” to Alabama unless Hodgson is hired as the next coach at UB. Hodgson is listed in Alabama’s online directory, but the listing does not include a title.